The Feminist UN Campaign has released its second-year report card on Secretary-General António Guterres. In 2017, the International Center for Research on Women (ICRW), on behalf of the Feminist UN Campaign, released a report, Toward a More Feminist United Nations, articulating a broad vision for feminist leadership across the UN system. The Feminist UN Campaign brings together leading, feminist thinkers in civil society, philanthropy, academia and former UN staff around a shared agenda for women’s rights and gender equality at the United Nations. The Feminist UN Campaign defines a feminist leadership agenda as a full-fledged women’s rights agenda based on UN policies of human rights, equality, fairness and non-discrimination. It outlines which members of the Secretary-General’s administration are responsible for implementing its key provisions. And it calls for progress on such an agenda to be reported to the public on an annual basis with consultation from feminist civil society and UN staff to hone and implement. Secretary-General António Guterres took office in January 2017 amid unprecedented public and member-state demand for feminist leadership of the United Nations (UN). Throughout the course of his first two years, this call has persisted – driven largely by women’s civil society groups and feminist activists. Following the selection of Guterres as Secretary-General, the Campaign subsequently released a set of recommendations for a 100-day agenda he could implement to deliver real and meaningful change within that vision. At the end of that 100-day period, the Campaign issued its first progress report assessing Secretary-General Guterres’s progress against proposals for advancing women’s rights and gender equality at the UN, indicating that progress would continue to be measured at subsequent one- and two-year intervals. 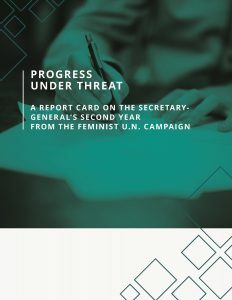 In early 2018, the Feminist UN Campaign completed its first-year progress report on the Secretary-General’s performance. The first-year report card can be found here. And on 23 January 2019, the Campaign released its second-year report card, which can be found here. The Campaign recognised his efforts with a grade of B-, up from C+ at the end of his first year. The review notes that, in his second year, Secretary-General Guterres increased public messaging on women’s rights and gender equality, was on track or ahead of schedule to achieve gender parity in UN leadership and was rolling out a number of efforts to address sexual harassment and gender-based violence – although internal backlash and bureaucracy threatened progress in a number of areas. But the authors – Teresa Casale, Lyric Thompson, Sarah Gammage and Lila O’Brien-Milne – also warned that progress is anything but assured. Initial actions taken by the Secretary-General to implement structural changes to promote gender equality have met considerable resistance – from staff and from member states – and the Secretary-General has not prioritised action on a number of issues the Campaign has put forward on its agenda. 1 – Implement A Feminist Leadership Agenda For The United Nations: Secretary-General Guterres should set out and implement a full-fledged women’s rights agenda for the duration of his term, including a commitment to report on progress and work with feminist civil society to hone and implement it. 2 – Ensure Feminist Implementation and Accountability for the Sustainable Development Goals (SDGS): The SDGs represent the single best opportunity to achieve gender equality and include a focus on gender and advance women’s rights across the UN’s efforts. Ensure the goals have a strong accountability framework and continue to focus on gender including and beyond Goal 5, and in alignment align with other commitments such as the Beijing Platform for Action and have a clear mandate for oversight at the Commission on the Status of Women (CSW). 3 – Finance For Gender Equality: Ensure there are sufficient funds committed to gender equality across the UN, including full funding for UN Women as well as for gender integration throughout the UN system. Convene an annual High-Level Panel on Financing Gender Equality to analyse and present the state of financing for women’s rights and gender equality within the UN system. Publish funding sources to enhance transparency across all agencies. 4 – Utilise Feminist Leadership: Increase the numbers of women and feminists in UN leadership, and protect women’s rights across the system. Secretary-General Guterres should achieve gender parity in his appointments, call for nominations for strong female candidates to head critical agencies and establish and implement feminist policies across the system, including whistle-blower policies and a zero-tolerance policy for all forms of gender-based violence. 5 – Enable A Feminist Transformation for CSW and UN Women: Commit to ensure that the Commission on the Status of Women and UN Women live up to their potential by serving as inclusive platforms for civil society participation, with a specific focus on the inclusion of southern, feminist voices. 6 – Promote The Freedom Of Information In The UN System: Announce system-wide reforms to increase transparency within the UN and to build public trust in the UN system. Institute universal Gender SWAPs for all UN agencies and bodies, including the fifth committee, and make that data publicly available on a central platform. The overall weighted average score was informed by scores on each of these six dimensions and the subcomponents that were tracked under each one. To read the second-year report card, click here.